It’s an event of dinosaur proportions! Join everyone’s favorite purple dinosaur Barney® in 10 of his most loveable, huggable episodes in the all-new Barney: Most Loveable Moments arriving on DVD, Digital Download and On Demand September 18, 2012 from Lionsgate Home Entertainment and HIT Entertainment. With seven bonus features including games, read-along stories, sing-a-long tunes and a collectible O-card, this special 2-disc DVD set helps little ones learn the importance of working together, being a friend and keeping promises. Trusted by moms and adored by children, Barney displays sharing, caring, imagining, dancing and learning on television, online and through live events, home entertainment, toys and publishing. The Emmy® award-winning series, Barney & Friends® is one of the top-rated preschool shows today, airing on PBS KIDS® and Sprout®. 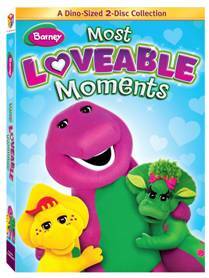 If you and your children LOVE Barney, then make sure to get this Most Loveable Moments DVD to have all your favorite episodes on ONE DVD! I love the lessons my son learns from Barney, like working together, learning shapes, numbers and letters, and I love hearing him sing all of the fun songs from Barney!